The global body worn insect repellents market is the focus of study of a recent market research report published by Transparency Market Research (TMR). Insect repellents are the products that help repel insects and thus, provide protection against insect bites to those applying them. The report projects healthy growth prospects for the market over the forecast period between 2015 and 2021. 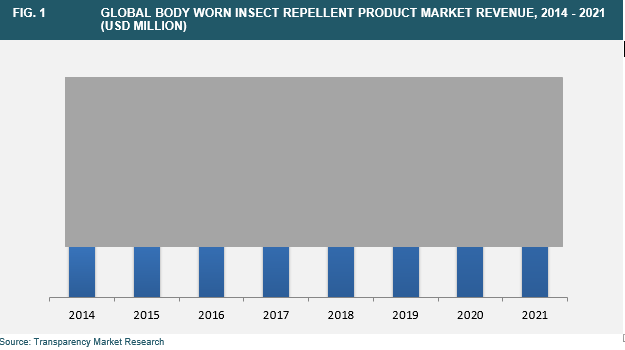 According to the report, the market, which had a valuation of US$230 mn in 2014, will expand at a 7.4% CAGR and rise to US$378.3 mn by 2021.The report is titled “Body Worn Insect Repellent Market - Global Industry Analysis, Size, Share, Growth, Trends and Forecast 2015 - 2021”, and is available on the company website for sale. Certain factors such as the rising network of organized distribution channels and the easy availability of insect repellent products on e-shopping websites such as eBay, Wal-Mart, and Amazon are propelling the global body worn insect repellent market. Entering into joint ventures with a number of online vendors for selling insect repellents exclusively from one platform is a popular trend in the market.The report segments the market on the basis of two criteria: product type and geography.On the basis of product type, the market is segmented into oil and creams, stickers and patches, and apparel. The segment of oils and creams is further segmented into synthetic and plant based products. The section of apparel is segmented into shirts, trousers, head nets, jackets, and other products. Of these, the segment of insect repellent oils and creams held the largest share of the market, followed by the segment of insect repellent stickers and patches in 2014. In insect repellent oils and creams, the segment of plant-based oils and creams held the largest share in 2014 and is expected to remain the largest market segment over the report’s forecast period as well.On the basis of geography, the market has been segmented into North America, Asia Pacific, Europe, and Rest of the World. Of these, the regional market of North America held the largest share of the market, followed by Asia Pacific in 2014. In North America, the U.S. held the largest share in 2014. Over the report’s forecast period, North America is expected to lead the global market by accounting for a 34.1% share, followed by Asia Pacific, which is projected to acquire nearly 30% share in the global market by 2021.The report also presents a comprehensive overview of the competitive landscape of the global body worn insect repellent market. The report presents detailed business profiles, SWOT analysis, details regarding financial and business strategies, and other details about some of the key vendors in the market, which are Reckitt Benckiser Group plc, Avon Products Inc., S. C. Johnson & Son, Inc., Sawyer Products Inc., The Orvis Company Inc., E.I. du Pont de Nemours and Company, BASF SE, Mountain Warehouse Ltd., Insect Shield LLC, and ExOfficio LLC.